I started my blog on May 1, 2016. I was committed and determined to make it no matter how hard I fell, stumbled, or flailed. As a writer, I was scared about trying to write to readers everyday. About what? I didn’t know? 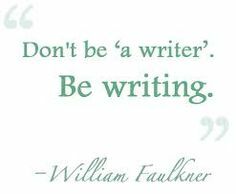 I have found a lot of people who profess to be writers who don’t write or don’t make the time because the desire to write doesn’t run deeply or truly isn’t real. I do not judge them, we can all say we like to write or do write. However, only a handful breath writing as part of their life blood and only fewer write because they would die without writing words on whatever medium (a journal, the computer, or a scrap of paper). My commitment to write stems from a place so deep, so raw, so surreal, I almost burst sometimes when I don’t or can’t get to writing. I am over three hundred posts now, and I have written everyday except one day when I was going through Adderall withdrawals. Most days, I have written twice a day but it bothers me that so many people take writing, the hardest of crafts so loosely and without pause. I am not sure why it is that so many people take writing for granted and toss it around like a hot cube of burning charcoal. I can only concentrate on me and the task at hand which lays in front of me. I have committed to myself, to my readers, to my craft I need to breath, to write and blog daily to my audience even if it means one person. Developing a readership or following takes work and you must be willing to write for only you, and nobody else. Gradually you become comfortable and as you put yourself, your blood and sweat into your writing. The readers come, and you build your audience that pretty much stands and stays with you through your great pieces, to your worst efforts. My audience has grown a lot and I am grateful and so thankful for their forgiveness when I do post less than what they deserve. I don’t know until I have published that my post is subpar, or not worthy of reading by my audience. Sometimes I just cringe and want to delete the post, but I have learned to be brave, and my followers are so gracious and bear with the major hiccups I have sometimes produced and did produce daily at the beginning of this journey. This odyssey is like a dream I fell asleep into in May and haven’t woke up from since. I have produced a few rare pieces of writing I am proud of, although try as I do daily to write and give my best, I mostly fall short. There are so many people who are so much more gifted as a writer than I, but they don’t have the passion or will to see their craft through or put themselves out their for maybe just themselves, or one or two people. Those first few days were the hardest. I wrote for sometimes only 8-15 people. Humbling, you bet. Discouraging definitely, and motivating my gosh to a fault! I wish with all my being, that the great writers did write, I long to read their words, their thoughts so deftly crafted. I want to learn from the truly gifted and desire and long for those I honestly look up to and want and long to learn from these treasures for me in the world of writing. So I wish and hope that people give writing and the craft of writing more respect as it is my lover, my passion, my life blood. It would make me so happy and more comfortable with people if they held writing, the craft of all personal crafts, the reverence it deserves in this world where most things have been compromised and diluted to the point of meaninglessness. Writing I hope for the sake of so many reasons retains the respect and esteem it deserves and has earned through the ages of the great writers of the world.